Like many of her girlfriends, Islander has a fascination with royalty. Her home state of Hawaii was once its own thriving country ruled by a monarch (from King Kamehameha to Queen Liliuokalani) and she enjoys visiting their Victorian-influenced palaces that still remain as historic landmarks. Islander was also transfixed on the television during the worldwide broadcasts of the fairytale wedding (1981) and solemn funeral (1997) of Princess Diana, and she anticipates celebrating the royal nuptials of her son, William of Wales, heir to the British throne, and Kate Middleton on April 29, 2011. For a simple yet regal observance of the Feast Day of the Three Kings (Three Wise Men or Magi), Islander makes a simple French-style king’s cake, galette des rois. Like many special dishes associated around the new year and Epiphany, this king’s cake may contain a hidden trinket, such as a dried bean (la féve), porcelain figurine, ceramic trinket or gold coin, to symbolize the Baby Jesus hiding from King Herod. Traditionally, the one who finds the trinket in his/her slice will be blessed with good luck for the rest of the year and even gets to be king or queen for the day. 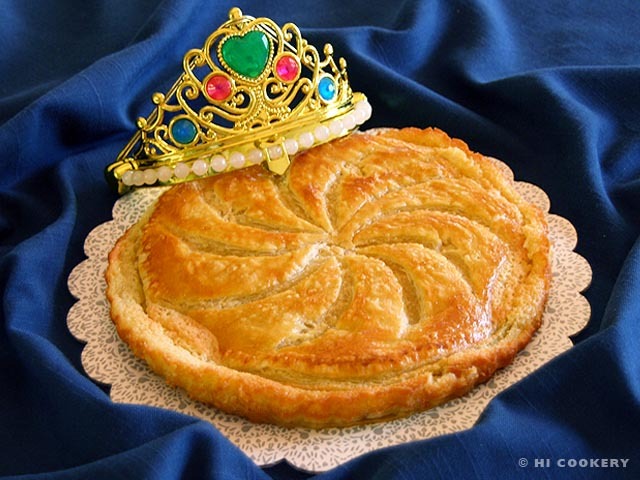 Top the galette des rois with a crown to represent the real royal of our lives—Jesus Christ, the King of All Kings! 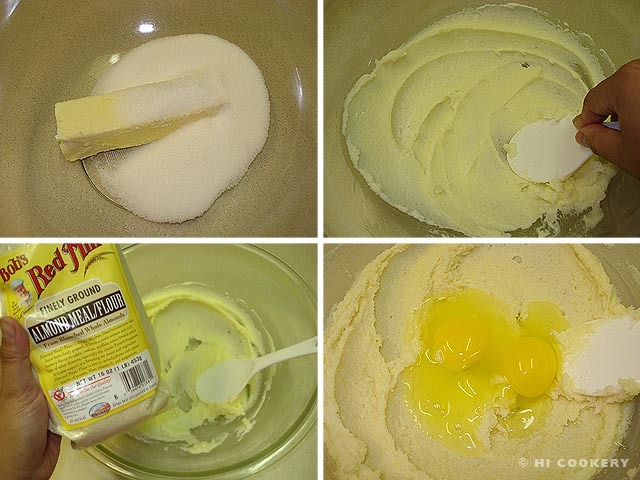 In a mixing bowl, cream the butter with the sugar. Add the extract, almonds, two eggs and cornstarch and mix until smooth. Cover and chill the filling for an hour or overnight. Line a baking sheet with parchment paper. 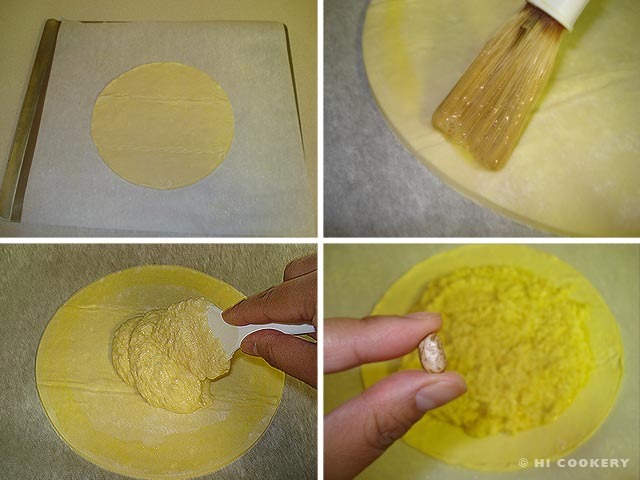 Unfold the thawed puff pastry and, using a round template, cut two circles. Lay one circle on the parchment paper. Moisten a 1 ½ inch rim with the remaining beaten egg, being careful not to go over the edge or it might prevent the pastry dough from rising. Spread the filling mixture on top. Place the dried bean on the filling. Lay the other puff pastry circle on top. Seal well by pressing the tines of the fork on the edges. Make decorative score marks on top with a sharp paring knife. Prick a few vents on top. Freeze for about an hour or refrigerate overnight. 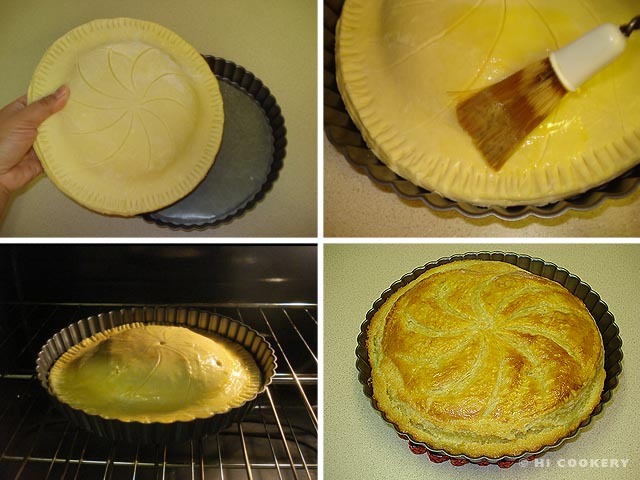 Transfer the cold galette des rois to a slightly larger round cake or tart pan with a lip. Brush with egg wash, being careful not to let it drip on the sides or it might prevent the pastry dough from rising. Bake in a preheated oven at 375 degrees F for 25-30 minutes. The galette des rois is done when the pastry if puffed up and turns a golden brown color. Remove from the oven to let cool. Before serving, sprinkle with powdered sugar (optional) and decorate with a paper crown or toy tiara. 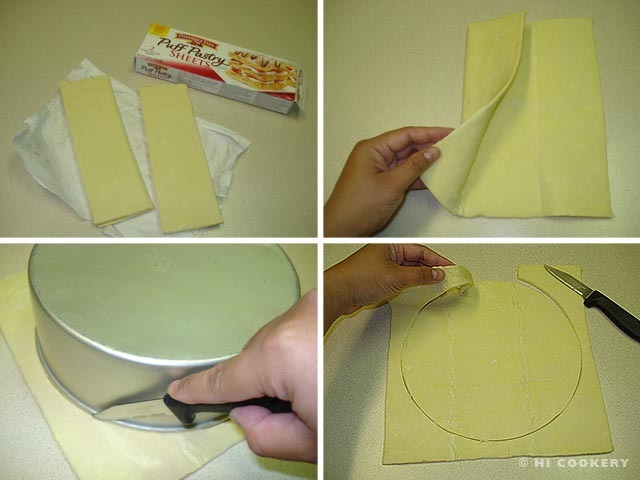 We used an 8-inch round pan as a template to cut the puff pastry. 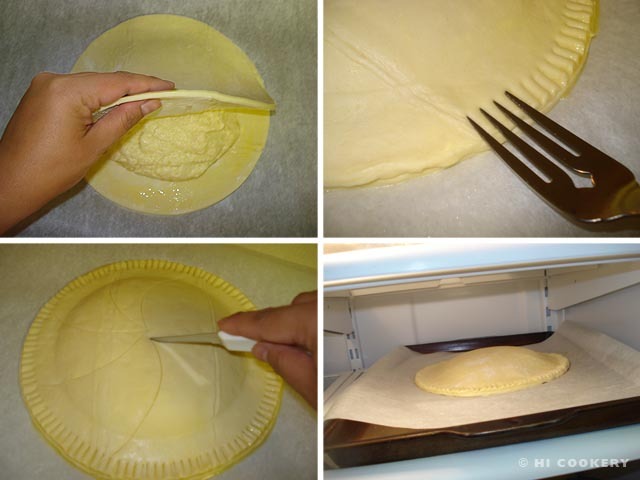 We used a 9-inch fluted tart pan with a removable bottom lined with wax paper in which to bake our galette des rois. Let others know about la féve or hidden trinket in the cake. Explain its symbolism and issue a safety warning before eating a slice of it. Traditionally, the one whose slice contains la féve or hidden trinket becomes the king or queen of the day and is entitled to wear the paper crown or toy tiara. January 6 signals the end of the Christmas season as it is the 12th day of Christmas or Twelfth Night. The Christian calendar then returns to Ordinary Time in the liturgical year. There are many variations of king’s cakes around the world. Search our blog for different recipes for the new year, Epiphany and Mardi Gras.